In Morocco there is a really unique holiday called Mimouna. It really only happens there or in communities that have a Moroccan Jewish diaspora population. It happens the day after Passover and and marks the start of spring and the return of chametz or bread products. Last year I wrote a whole post with many more details about the holiday – I really think it’s worth a read! What I really love about this holiday is that it breaks down some stereotypes. As I mentioned in my earlier post, my husband grew up in the kasbah of Marrakech, which is near the mellah or area of town where many Jews lived. He remembers this holiday, the treats that were made and sold and that Muslim neighbors would bring bread or other baked goods to their Jewish neighbors to celebrate. His mom has even more memories of this time as when she was younger the Jewish population of Morocco was much larger. I created this easy recipe for a Moroccan style haroset. Haroset, sometimes spelled charoset, is a paste of fruit and nuts eaten at Passover seders. It’s meant to symbolize the mortar used by the Isrealites during their enslavement in Egypt. There are really a lot of different ways it is made, dependent on geography. 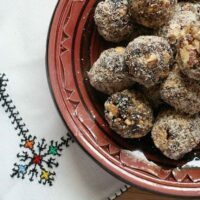 I’ve seen several different variations for a Moroccan version and decided on the ingredients based on my experience with ingredients in the country. The paste made can be left as a paste and spread on matzoh or eaten with a spoon or it can be rolled into balls. 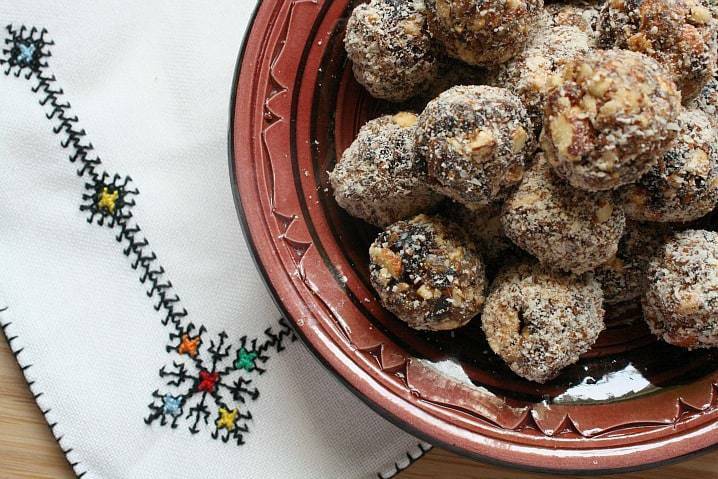 I decided on making the balls because there are a lot of other Moroccan sweets done similarly. It really felt most true to what would be done in Morocco. Even if you’re not celebrating Passover I think this is a great snack! It’s healthy, easy to make and store, and unique. 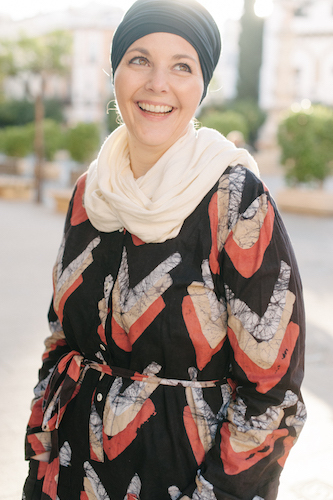 If you’re not sure what Passover (or a seder) is, my friend Laura of Mother Would Know did a great interview with Yvonne of My Halal Kitchen to answer all of her questions about this holiday! 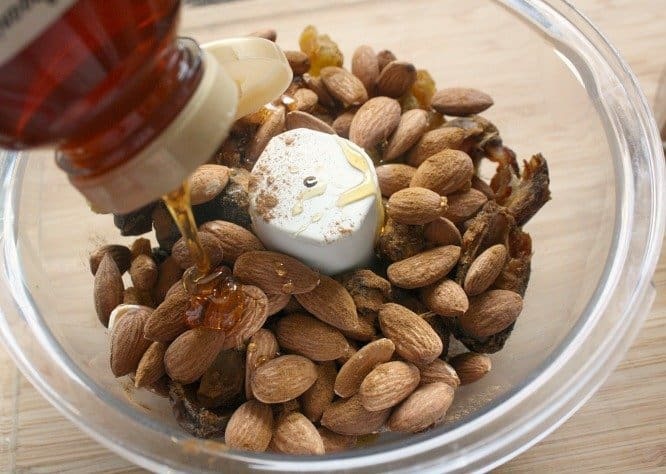 An easy and nutritious snack to make for Passover or anytime of year. 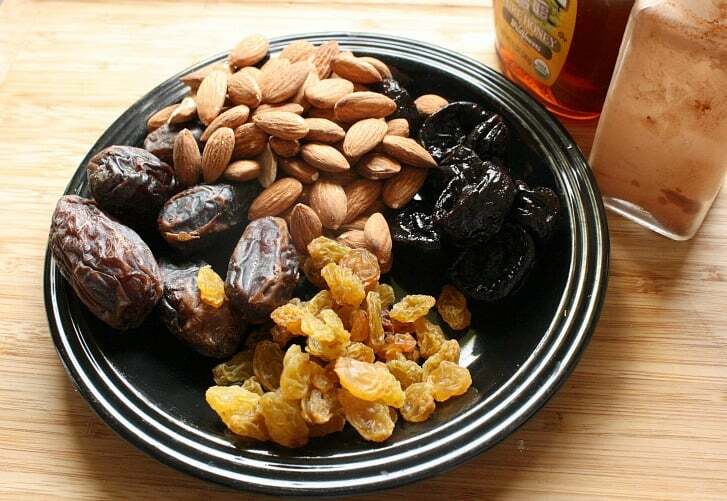 It is very important to pit the dates and prunes used in this recipe. So take a minute to make sure they are pitted! The next step is really easy - simply toss everything into a food processor and blend it together. After you've mixed everything take a taste. If the mixture is really thick add some grape juice or kosher wine. If it tastes too bitter add a little bit of sugar. That being said this is not meant to be overly sweet. To roll the haroset balls, take a piece of the mixture about the size of large olive and roll into a ball. Next, roll it in the ground almonds and set aside. Continue with the remaining mixture until it has all been used. To store, keep in a cool place, but don't refrigerate, in a tightly sealed container. Sounds like a great flavor combo to me! Thanks for sharing! I have never heard of this, but it sounds so delicious! Thanks for sharing! I’ve had Haroset before at many Seders but yours looks particularly new and different. Will have to give it a whirl. Amanda, I love that you introduce use to new Holidays and Cultures. What a beautiful post and recipe! Thank you for sharing during #SundaySupper. My word, I love this dish! It looks amazing and I bet tastes amazing too. I may have to give this a shot! I told Samantha that my mom used to make horoset when we celebrated Passover with another Catholic family on Holy Thursday. It was never my favorite dish…and now I can see there are much tastier recipes out there! Your Moroccan version looks wonderful! These look amazing! Thank you also for sharing the history. These look and sound like the perfect treat to make. YUM! I’d eat this all year, not just Passover! I have never had haroset. Thank you for enlightening me. I love the ingredients/flavors you used! I had never heard of this treat before, but anything with dates and nuts is perfect for my taste buds. I could eat a dozen of those little balls in a minute! I love all of the ingredients! They remind me of little energy balls! This combination sounds soooo good! I made charoset too! I was just saying how there are so many different kinds of charoset! I mom made it with fresh fruit but I would LOVE to make your version with dried 🙂 Happy Passover! I never had haroset before, but I love everything you put into it! I have to make these! Love this Moroccan haroset, Amanda. I remember enjoying reading your Mimouna post last year. In Israel everyone pretty much now loves celebrating it or being invited to one. It’s a big deal. A great, fun tradition the Moroccans brought over. I particularly loved seeing your version of haroset as we are allergic to nuts and can’t make it with them. I’ve never had haroset but it looks like something I would very much enjoy. The ingredients are wonderful.